The American landscape has inspired generations of artists, but the 48 photographs in this exhibition—by Steve Fitch, Robbert Flick, and Elaine Mayes—are a far cry from traditional representations of the subject. 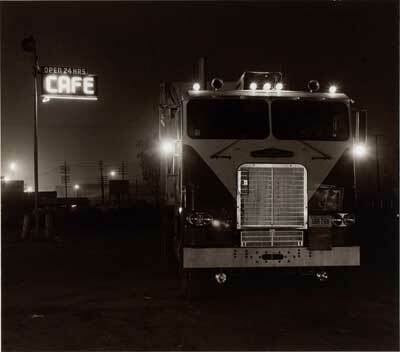 The photographs by Fitch, from his series Diesels and Dinosaurs (1971-76), capture the typical sights and attractions that defined roadside America. Flick’s photographs, drawn from his series Sequential Views, consist of grids of images made in Los Angeles in 1980 as he traversed the streets, stopping at prescribed temporal or geographical intervals. Mayes’s photographs, from her series Autolandscapes (1971), present America as seen from a moving car window.